Add the final touch to the outside of your home with our Black Tone Galvanized Metal Window Boxes. These window boxes are treated for outdoor use by using a two-step process. First we use metal that has been coated in zinc to help prevent rust. After we hand craft the window box, it is then powder-coated to ensure long lasting color and resistance to rain and watering. These strong resilient window boxes can also double as a liner in our wrought iron or aluminum cages, offering color contrast and an even more striking window box. The elegant black finish gives this window box liner enough charisma, it can be used as a window box itself. 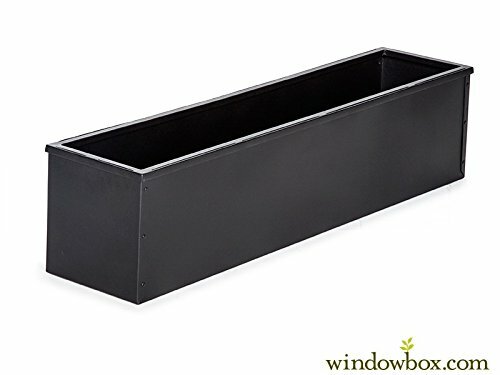 This window box measures 24" in length, 8" wide and 8.5" in height, and comes with pre-drilled drainage holes.